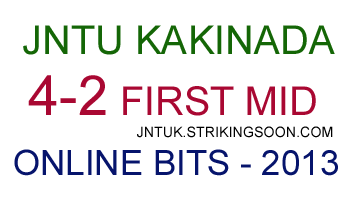 JNTU KAKINADA 4-2 first mid online bits for ECE , EEE , CSE , IT . Download JntuK 4-2 1st MID Online Bits & Read Online . Original Scanned copies & less papers for printing . NOTE : Electives For Some branches are not available , You can make a request to us by commenting below . plz upload DSPPA(DSP processors and architecture) bits 4-2 ECE..
Pls post 4-2 ece ddtv 1st mid online bits. Pls post 4-2 ece ddtv online bits ..